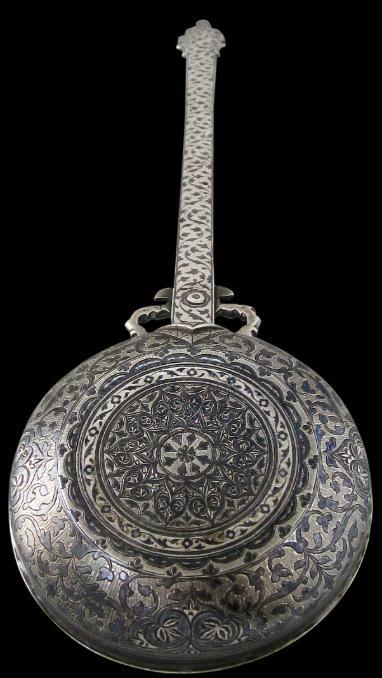 This is the finest Caucasian niello azarpeshi ladle that we have seen. The ladle is of traditional form with a circular, lipped shallow bowl and a long handle with cusped terminals further decorated with a Caucasian pinecone that attach to the bowl. 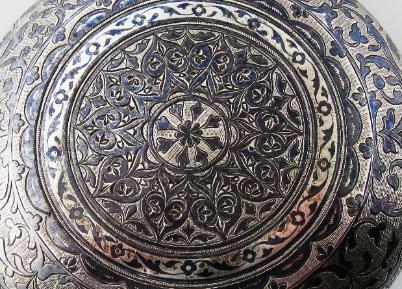 The back of the bowl is very finely patterned in niello with circular and scrolling medallion motifs. 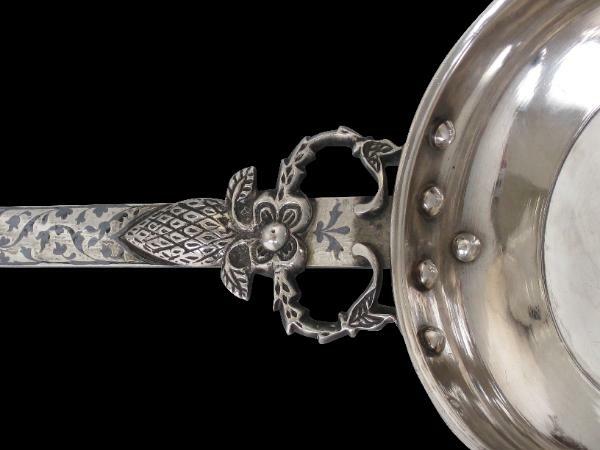 The handle is patterned in niello with a fine scrolling foliage motif. 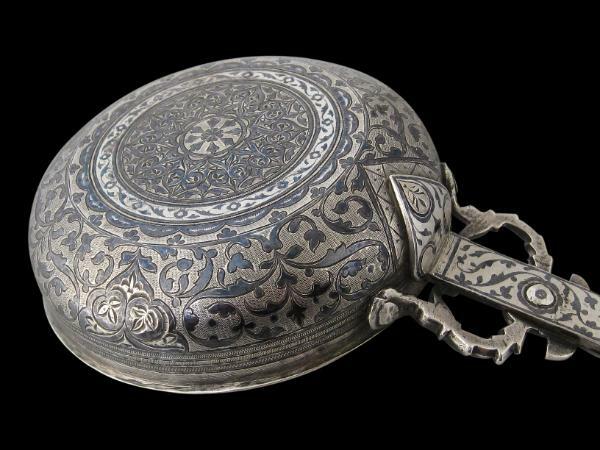 The top of the handle is stamped with various Georgian silver marks, including the number ’84’, and a mark in Arabic. The bowl also has an ’84’ stamp. 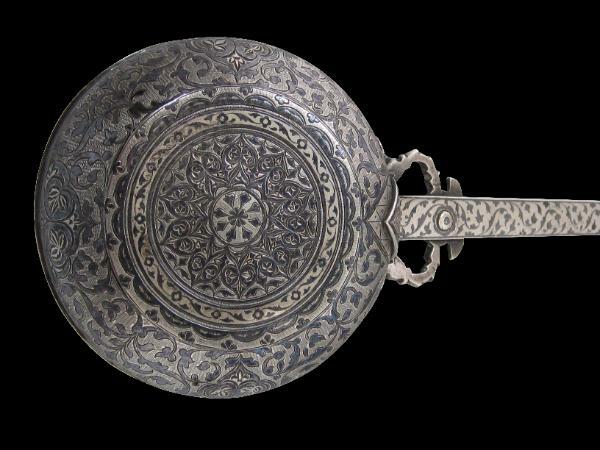 Ladles such as these were used at large Georgian feasts such as those associated with weddings to drink wine. Each drinker had a ladle and the wine was ladled from a large communal bowl or vat to the mouth. tamada or toast-master was the lead figure. He was required to propose toasts for all present, following strict rules of precedence. He also announced when there would be music, singing and dancing. The tamada was usually elected from among the most eloquent present. 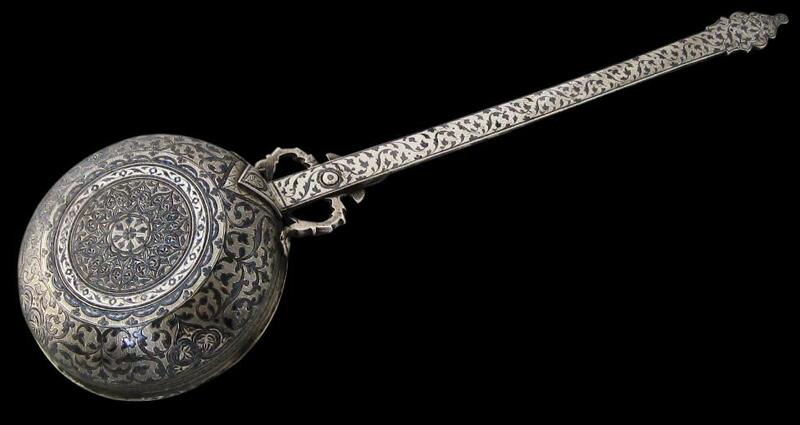 similar ladles are illustrated in The Caucasian Peoples, catalogue for an exhibition of the Russian Ethnographic Museum, staged at the Hessenhuis, Antwerp, Belgium, 2001, p. 161.